Step 1. Butterfly the chicken breasts by slicing them lengthways but not all the way through, then open up and press firmly. Step 2. Pan-fry the butterflied chicken breasts until sealed (not brown), then transfer to a preheated oven (200c) for ten minutes. Check the juices run clear or have reached above 75c. Step 3. To make the sauce add the cream and stock to a pan and bring to the boil, then simmer. Step 4. Make a paste with the cornflour and a little water; gradually add this to the cream until the consistency of double cream, simmer for a few minutes then turn off the heat. Step 5. Now add the crumbled Wensleydale Blue cheese and stir until melted. Finish with a small amount of chopped parsley. Step 6. 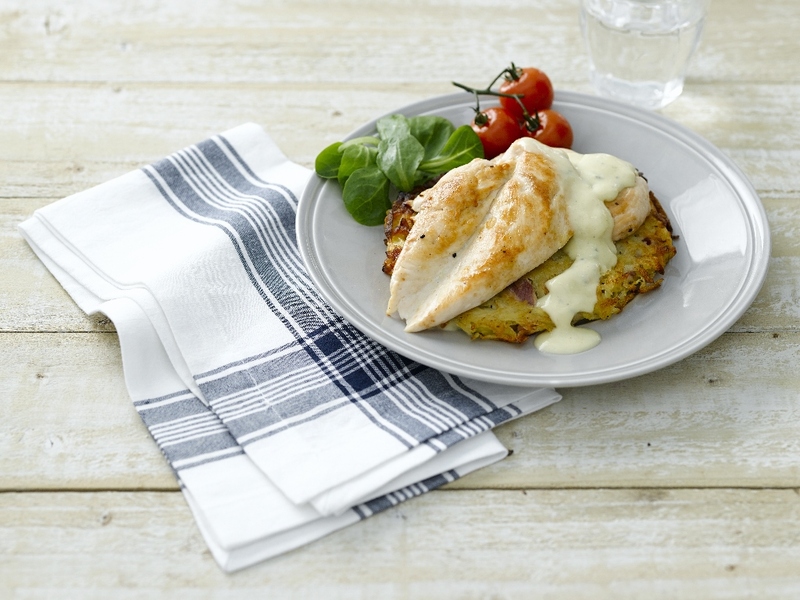 Once the chicken breasts are cooked, slice into two, place diagonally stacked on a plate and smother with the Wensleydale Blue Cheese Sauce. Sprinkle with chopped parsley and serve. What a mouth-watering recipe! In the photo above, are the chicken breasts resting on a galette of some kind? Looking forward to making this…assuming I can find a cheese as wonderful as yours here in Texas!